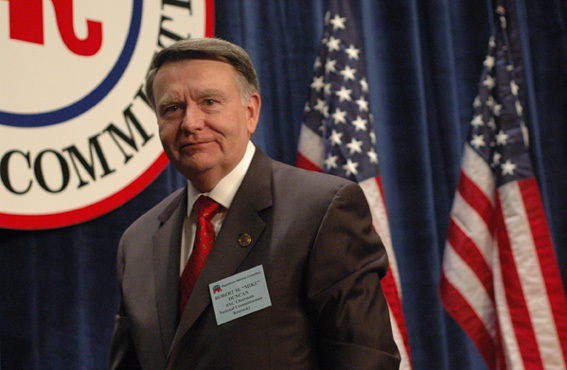 Jan. 29, 2009--At the Republican National Committee's Winter Meeting, RNC Chairman Mike Duncan is seeking to continue leading the party. He faces four challengers: Michigan GOP chair Saul Anuzis, former Ohio Secretary of State Ken Blackwell, South Carolina GOP chair Katon Dawson, and former Maryland Lt. Gov. Michael Steele. 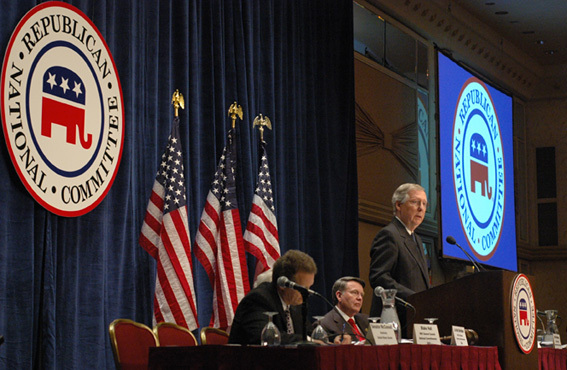 Senate Minority Leader Mitch McConnell (KY) warned that Republicans are in danger of becoming a regional party. However, pointing to the election of Joseph Cao to Congress from New Orleans, McConnell said "there are signs that a revival is beginning to take place." Earlier members heard from WSJ.com columnist John Fund. 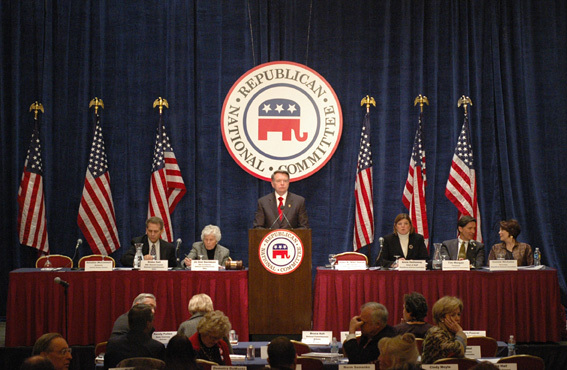 Fund said that, "It is only after the Republicans lose a presidential election that the RNC becomes truly relevant." Fund also signed copies of his book Stealing Elections: How Voter Fraud Threatens Our Democracy. The 168-member committee heard reports from its officers. Members adopted two resolutions, one honoring President George W. Bush and Vice President Richard Cheney, and one opposing federal government bailouts. Chairman Mike Duncan presented his report. Acknowledging that Republicans "took a beating" in 2008, Duncan stated that "since then we've won elections." He also pointed to the party's challenge of the Bipartisan Campaign Reform Act (BCRA) and to its new Center for Republican Renewal. "The Republican Party is off the mat," Duncan stated. He noted that the RNC has $13.8 million in cash on hand and no debt, and he predicted that "the Democratic Party will choke on the bone of responsibility." The five candidates for chairman will participate in a forum this evening, and officer elections occur tomorrow.